I am so thrilled for this cute movie to come out! If you haven't seen the previews, you are missing out! I can't wait to take Lydia to go and see it! From the studio that delivered The LEGO Movie. STORKS, in theaters September 23! Storks deliver babies…or at least they used to. Now they deliver packages for global internet giant Cornerstore. Junior, the company’s top delivery stork, is about to be promoted when he accidentally activates the Baby Making Machine, producing an adorable and wholly unauthorized baby girl. Desperate to deliver this bundle of trouble before the boss gets wise, Junior and his friend Tulip, the only human on Stork Mountain, race to make their first-ever baby drop – in a wild and revealing journey that could make more than one family whole and restore the storks’ true mission in the world. Win it: To celebrate the release of STORKS, one reader is going to win this giveaway! Storks, by Warner Bros. Pictures is In Theaters September 23rd. 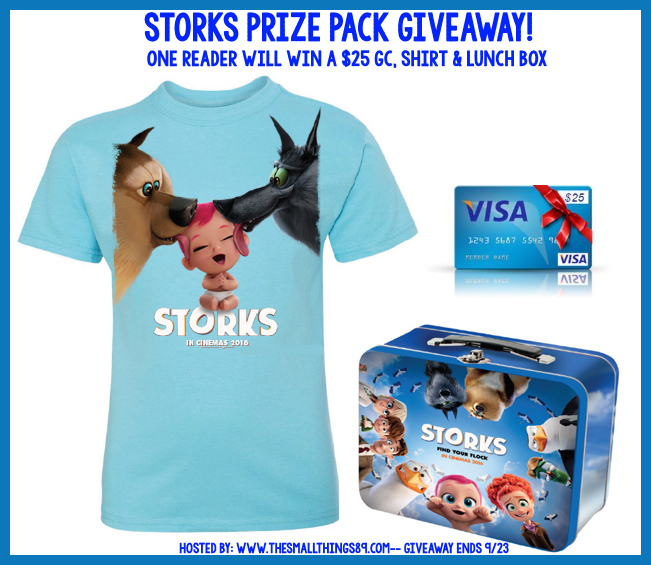 One reader is going to win a $25 Visa gift card to see Storks in theaters, aT-shirt and Lunchbox. Open to US mailing addresses only Prizing and samples courtesy of Warner Bros. The Small Things received the same prize in return for this post. Enter below. Goodluck. I want to win because my daughter has asked to see this movie. I would love to win because ever since the trailer came out my nieces and nephews have been begging me to take them! I would love to win because my son has been anxious to see this movie. Plus it looks funny! I'd love to win because the shirt is adorable and I'd love to use this gift card to take my grandsons to see the movie! I would like to win because my nephew would like the lunch box! I want to win this to take my kids to see Storks. I would love to win for my three kids. We watched the preview together and they are very excited about this movie. i would like to win since the family is excited to see the movie. I would love to win to take my grandson to see the movie. I want to win because I love that lunchbox, lol. My youngest nephew is looking forward to this movie. I want to win because this movie looks cute and fun. I want to win because I have 3 kids who would love to see this movie. This looks like a fun movie to go see with our friends who have young kids. Oh I would love to win and take the whole family. I think this looks so cute and would be a great movie that we can all enjoy together! I am looking forward to seeing this one. I like the cast and the adorable babies especially the chubby one. I want to win so I can take my kids to see the movie. It looks awesome and I'd love to see it. I would like to win because I could use the gift card to buy movie tickets to see this movie! I would love to win because we would love to use the gift card for tickets to see this movie! My daughter can woud love the lunch box & shirt too! I would love to win to take my nephew to see this movie! I want to win because this movie looks great to take the whole family. This looks like a fun movie for family movie night! I would love to win this awesome prize pack, so I can share it with my son and nieces. I am sure that they will love it! I want to win so I can take my mom to see this movie because I think she will like it. I want to win because the movie looks super cute and really funny. I haven't watched a really funny movie in a while, so this would be perfect! I want to win to take my youngest 2 children to see Storks. Love the tshirt and the lunchbox is so cute. I want to win so I can take my son to see this movie. I want to win to use the gift card for the movies. I want to win because my son would love the prize pack!